The concessions overlap with the titled territories of the Shuar, Achuar, Kichwa, Waorani, Shiwiar, Andoa and Sápara nations, with one block located almost entirely within Waorani territory. If taken over by the fossil fuel industry, the Indigenous coalition warns, the health and livelihoods of the communities living in the area—as well as the region’s unique biodiversity and sensitive ecosystem—will be threatened. 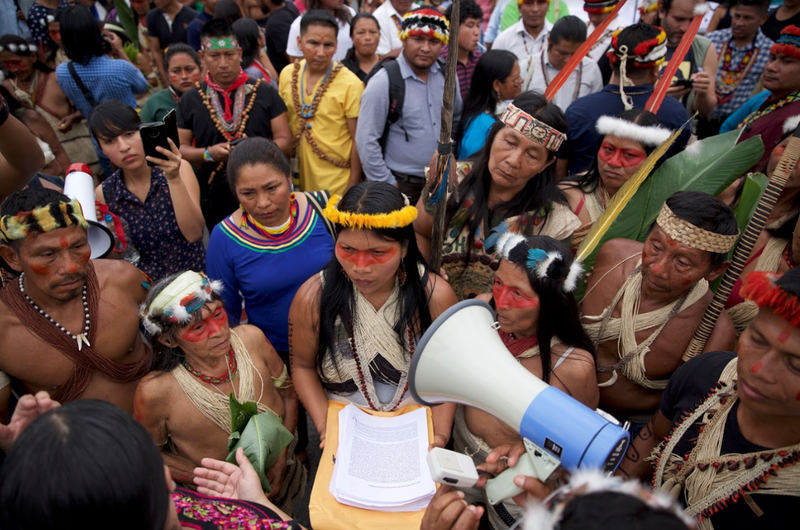 But regardless of the environmental and sociocultural threat, the plaintiffs argue that the concessions trample on their constitutional rights. Ecuador is one of the smallest oil producers in the Organization of the Petroleum Exporting Countries (OPEC)—only the Republic of the Congo, Equatorial Guinea and Gabon pump less. But that has not hindered it from making big deals with oil-hungry nations. In 2009, a year after Ecuador defaulted on around $3 billion worth of debt, then-President Rafael Correa made an oil-for-cash agreement with China. In exchange for selling his nation’s crude oil to Petrochina, China provided Ecuador with a $1 billion loan. The current lawsuit is the latest salvo in a protracted battle between Indigenous people across Ecuador and fossil fuel interests that has been going on since 1993, when local tribes turned to the legal system to compel Texaco—and now Chevron, its parent company since 2000—to clean up the Ecuadorian Amazon rainforest and care for the people who have been sickened by the oil operations that began in 1967, when Texaco struck oil in the country’s northeastern province of Sucumbíos. 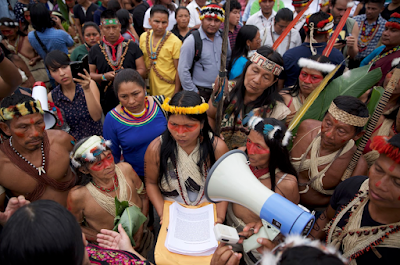 The Indigenous fight in Ecuador is a fight that anyone who cares about biodiversity and the global climate should join. After all, the Ecuadorian Amazon isn’t just one of the most sensitive ecosystems in the world—it’s key for the environmental health of the entire planet. Known as the “lungs of the planet,” the Amazon rainforest “inhales” carbon dioxide and “exhales” oxygen, helping to stabilize the global climate by safely storing up to 140 billion metric tons of carbon. Deforestation by extractive and agricultural industries releases this carbon into the atmosphere, further accelerating global warming, the effects of which are felt across the world, from rising seas along U.S. coasts and melting Arctic glaciers, to wildfires in Europe and droughts in Africa. Reynard Loki is a writing fellow and the editor and chief correspondent for Earth | Food | Life, a project of the Independent Media Institute. He previously served as the environment, food and animal rights editor at AlterNet and as a reporter for Justmeans/3BL Media covering sustainability and corporate social responsibility. He was named one of FilterBuy’s “Top 50 Health & Environmental Journalists to Follow” in 2016. His work has been published by Truthout, Salon, BillMoyers.com, EcoWatch and Truthdig, among others.